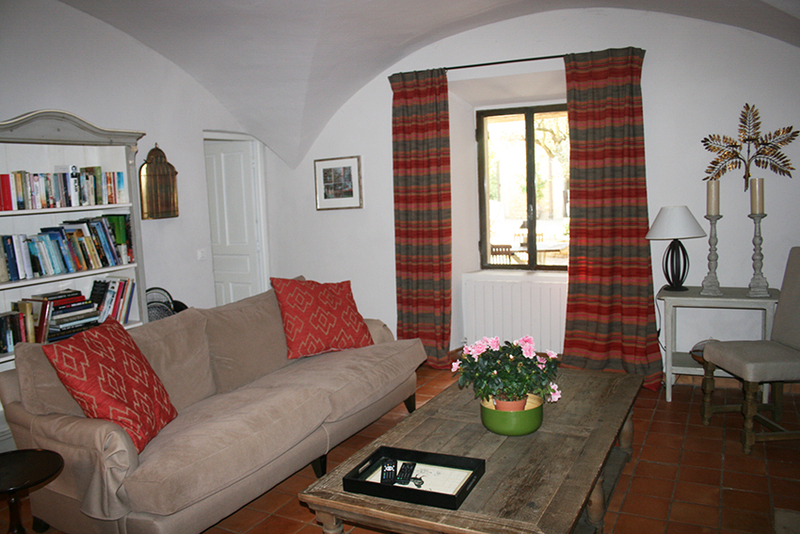 Bedrooms are in both the Farmhouse and the Bergerie. 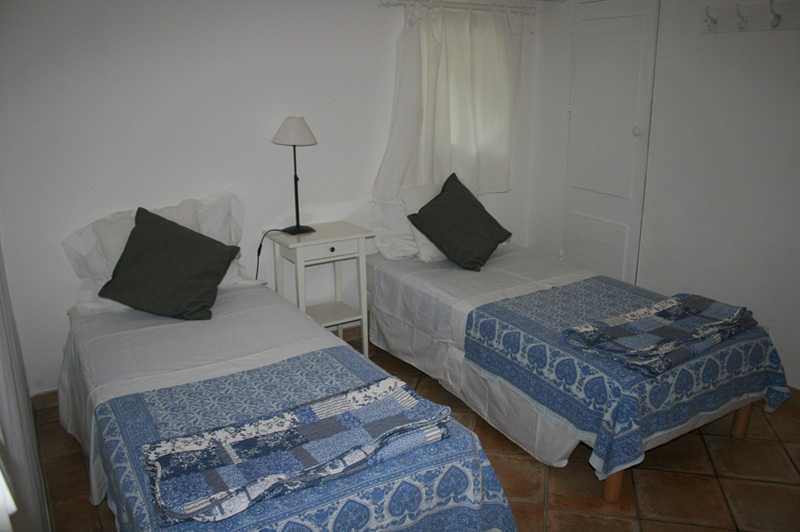 All linen including bath towels and pool towels is supplied. 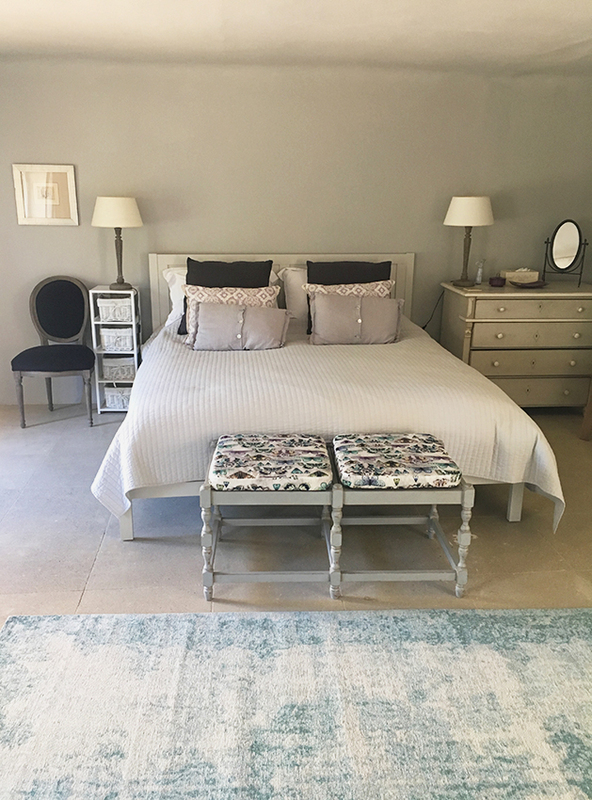 On the first floor with 6' superking bed, views over garden and courtyard; chest of drawers, wardrobe and walk in cupboard; own outside steps to garden; own bath and double basin within the room and shower and wc behind wooden doors. Linked to Bedroom Five. 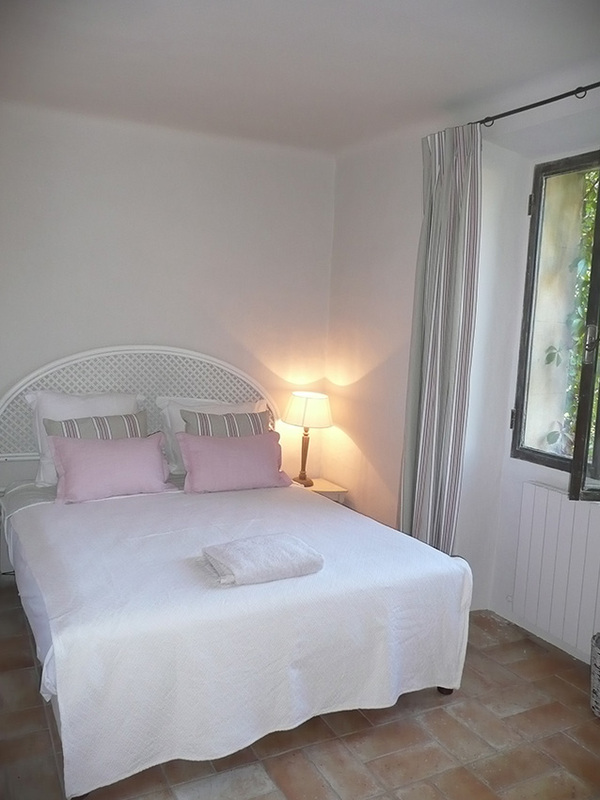 On the first floor, a huge bedroom with views over the courtyard and beyond. 5’ kingsize bed, two chests of drawers and wardrobe. Works well as a second ‘master bedroom’ even though it shares the new Bathroom Two (walk in shower, bath, wc and twin basins) with Bedroom Three. 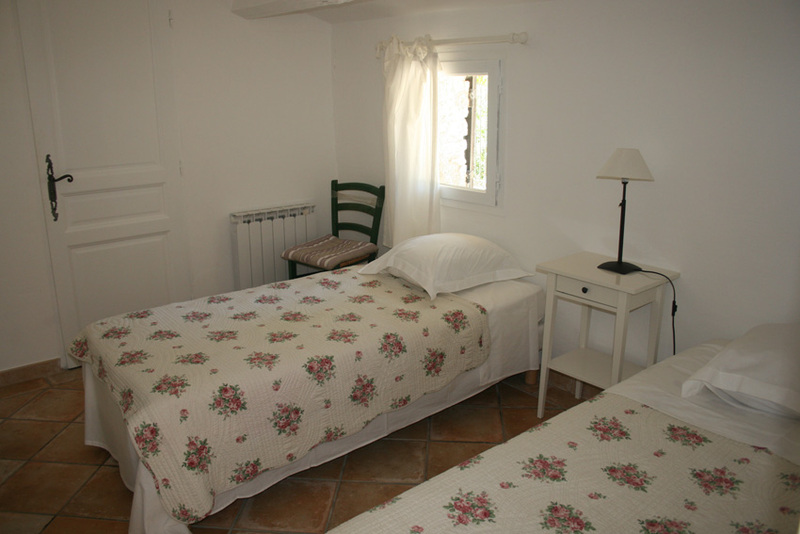 On the first floor, a smaller bedroom with 5’ kingsize bed and chest of drawers. Views towards swimming pool. Next to Bathroom Two. 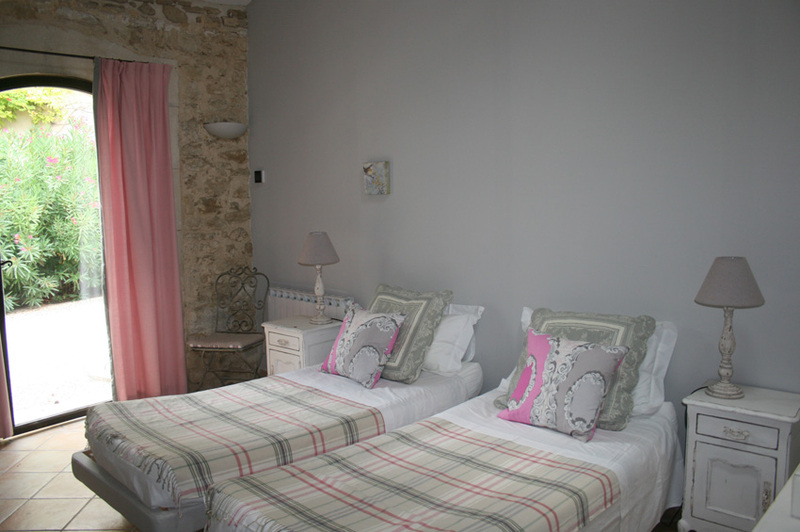 On the second floor, another huge bedroom with two 5’ kingsize beds, a very large chest of drawers, walk in cupboard, separate toilet and next to newly refurbished Bathroom Three with walk-in shower and basin. Bedroom Five: On the first floor, access through Bedroom One so ideal for children with parents in Bedroom One. NB steep spiral staircase leads up to this room from Dining room. 5' wrought iron kingsize bed, chest of drawers, cot available. 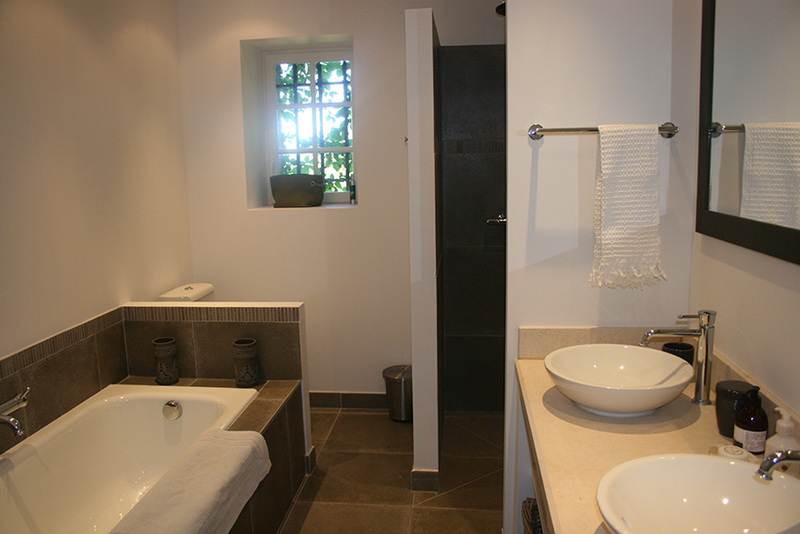 Own shower and basin in room and loo shared with Bedroom One. 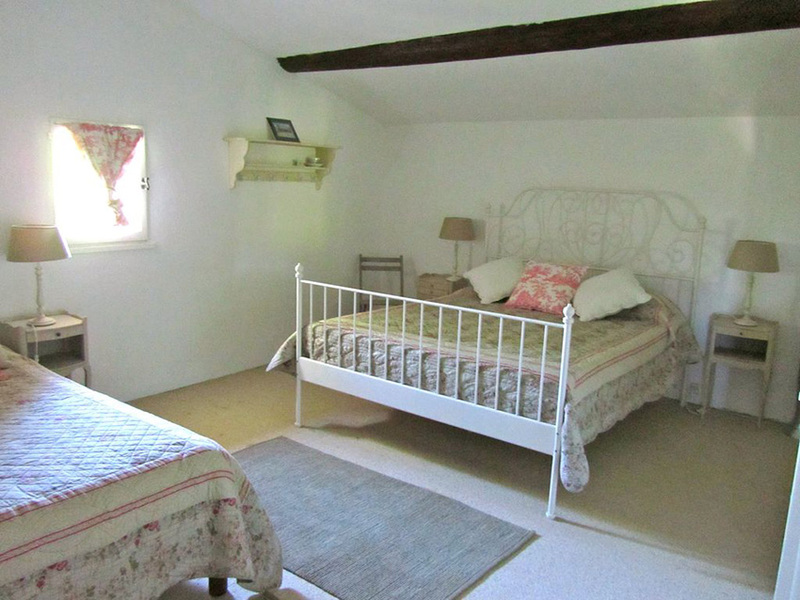 Bedroom Six: High barn ceiling; French doors onto the courtyard; hanging cupboard; chest of drawers; two 3’ single beds which can be made into a 6’ superking double bed. 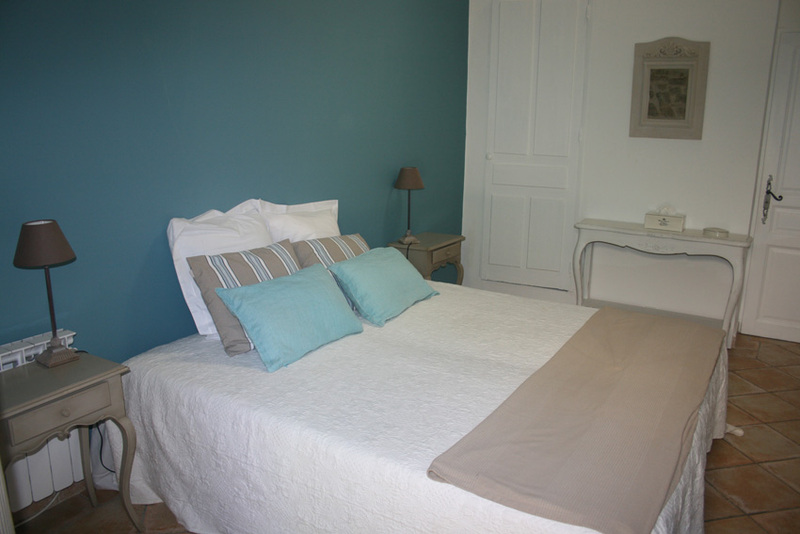 Leads off Bergerie salon; two 3’ single beds which can be made up to a 6’ superking bed; window onto garden; dresser; small cupboard. 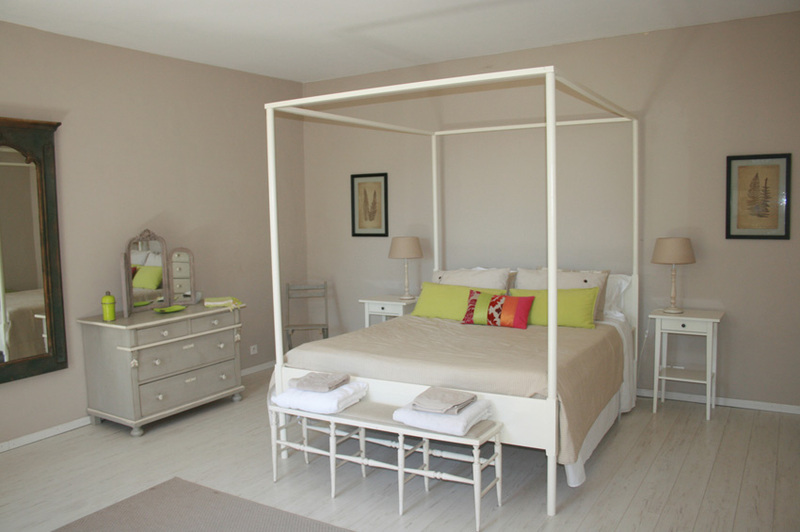 Leads off Bergerie salon; two 3’ single beds which can be made up to a 6’ superking bed; window onto back garden; chest of drawers; hanging cupboard. 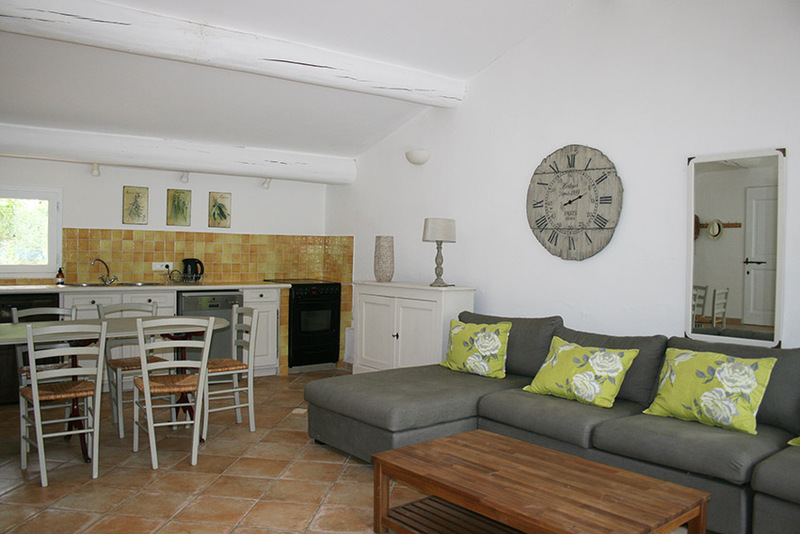 The Farmhouse has a new kitchen (18 sq m) which remains cool in the height of summer and is beautifully equipped with two full size fridge freezers, Falcon Professional Range cooker, dishwasher, microwave, Magimix, Nespresso coffee machine etc. 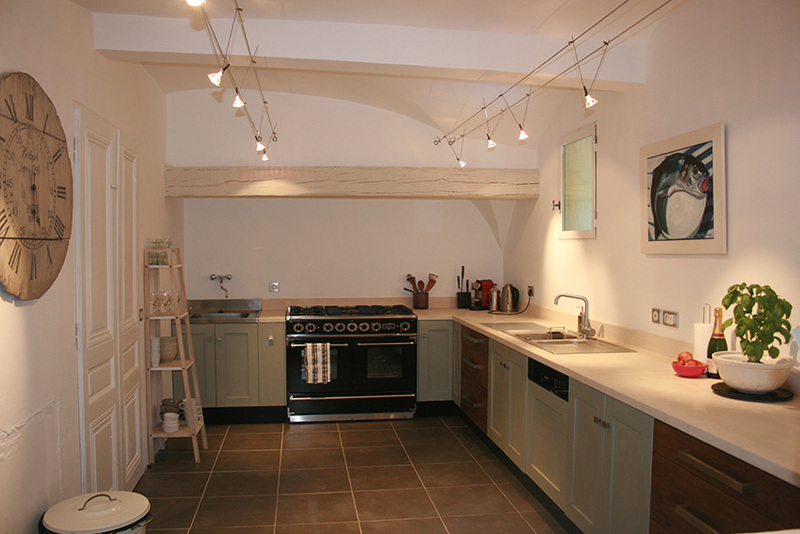 A utility room leads off the larder and contains a washing machine and tumble dryer. 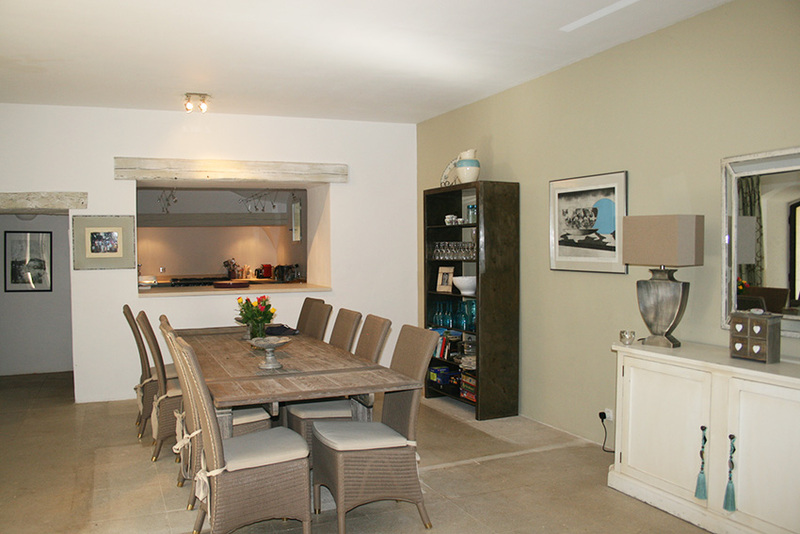 There is also a very large Dining/Reception room adjoining the kitchen with dining table, sofa, CD player and Bose speaker with two sets of French windows which open onto the courtyard. Additionally there is a big Sitting Room with a lovely vaulted ceiling furnished with large sofas, a beautiful fireplace (logs provided) and television with Sky and DVD player. There is a good DVD library. 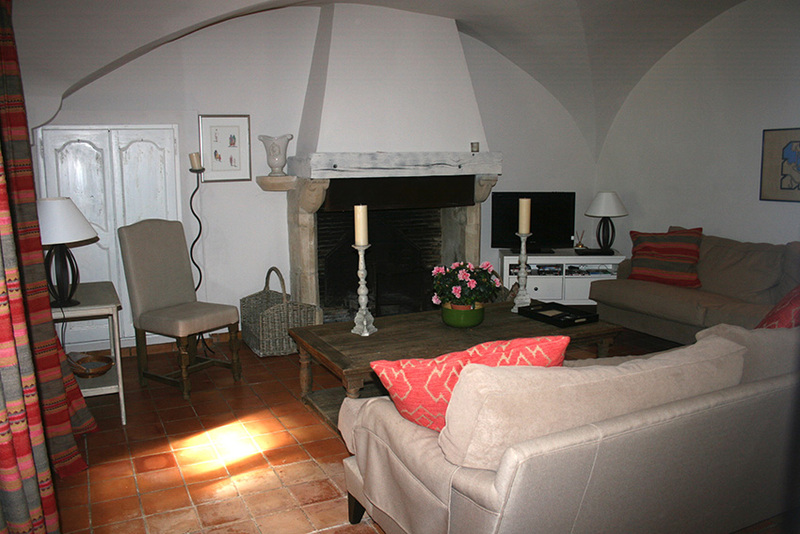 The Bergerie has a very large Reception room (76 sq m) with sofas, dining table for 8 and French doors to its own pretty back garden and terrace with table tennis. It is equipped with a fridge, cooker and dishwasher. Bedrooms 8 and 9 with ensuite shower rooms lead off this reception room. The furniture in this room can be easily moved out to create a perfect space for Pilates/yoga/painting etc groups up to 10. Broadband WiFi access is available.